A total of 100,000 home dengue protection kits will be distributed in Selangor, Kuala Lumpur and Johor starting next month in an effort to address the problem in the country. Ministry of Science, Technology and Innovation deputy secretary- general Dr Zulkifli Mohamed Hashim said two areas in Selangor namely USJ1 in Zone 4 Subang Jaya and Taman Melati, Gombak; and Kampung Padang in Kampung Baru, Kuala Lumpur, were the first three communities selected for the “Dengue Free Community” pilot programme. “We aim to use these kits to reduce the number of dengue cases in these states within a year,” he told reporters after representing Minister Datuk Seri Dr Ewon Ebin at the launch of the programme at USJ 1 near Petaling Jaya today. Dr Zulkifli said the kit contained biolarvicide, Mousticide, which could kill mosquito larvae; mosquito deterrent lotion; and ovitraps specially designed to detect and kill eggs and larvae of aedes mosquitoes to eliminate breeding. 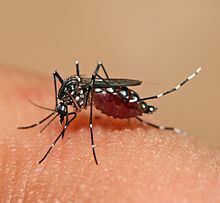 “It has been proven successful overseas, eliminating mosquito breeding by 100% within one to two months,” he said. He added that the ministry was considering expanding the programme to other states like Pahang, Sabah and Malacca. – Bernama, June 21, 2015.